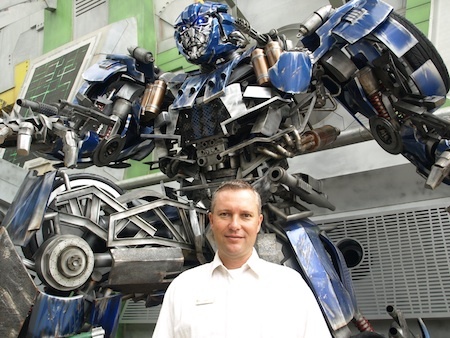 December 3, 2011, 2:44 AM · SINGAPORE - After getting my turn on Transformers: The Ride Friday morning, I got the chance to sit down with Universal Creative ride designer Thierry Coup (the man behind Harry Potter and the Forbidden Journey and The Amazing Adventures of Spider-Man, as well as Transformers) and Universal Studios Singapore Vice President for Operations John Hallenbeck, to talk about the ride and where it fits within Universal Studios Singapore. During our conversation, Thierry described the ride in great detail (skip over his first two answers if you don't want to read spoilers), then got into some of the ways that Universal builds detail into rides, not only to make them creatively engaging, but operationally functional, as well. I also asked Thierry if Transformers would come to Orlando. At a press conference immediately before our conversation, Thierry denied that there were any plans to bring the Wizarding World of Harry Potter to Singapore. 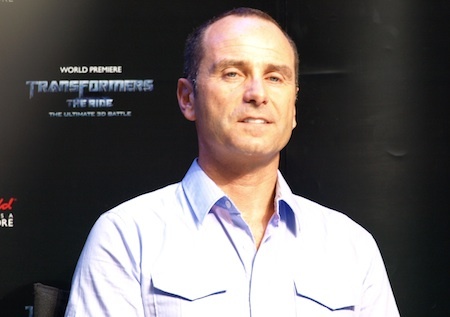 (I'll be posting a video of that press conference, which included Transformers film director Michael Bay, later.) But he demurred on that topic regarding Hollywood, saying only that Universal has "great plans for that park." Robert: Set up the ride for a new visitor. What can they expect? Thierry: The premise is that the guests are coming into the NEST facility. NEST stands for Nonbiological Extraterrestrial Species Treaty - it's an alliance with the Autobots and the government to protect the Earth from Decepticons. They really are protecting the Allspark shard, which is the remain of the Cube, which is the source of power for the Transformers. Autobots are the good guys; Decepticons are the bad guys. So we're coming in, as guests, to be recruits, and we make our way deeper and deeper into the NEST facility. First, we meet General Morshower from the films, who welcomes us to the facility and tells us what our orientation is going to be about, that we'll be meeting some of the Autobots, then we'll be introduced to the Decepticons through monitors and then see control rooms and the Allspark shard, which is housed in an incredible chamber. Eventually, we find out as we are getting deeper into our orientation that Decepticons are coming and they are about to break into the NEST facility. So our orientation is cut short and we have to be recruited to go on the mission to take the Allspark to safety. We find there is an Autobot named EVAC, which has been designed to take military personnel and equipment to safety. It's a very fast robot, with weapons. We meet him on the monitors and see that he can transform into three modes: He can be a robot, and he can be a car in regular mode, or in hybrid mode - hybrid mode is fully weaponized, with all these incredible weapons. [EVAC] welcomes us and says that he wants us to come along with him on this mission because we are new recruits. He's new to battle, too, so it's kind of nice that we have that connection with him. We're new. He's new. He's asking us to be part of his team, to go take the Allspark to safety. We see him transform on the monitor, and when we come around the corner, we see him in the station, at the loading dock, and we get on board and take off on our mission. Robert: And then, in great theme park tradition, something goes terribly wrong. Thierry: Yeah, it has to. It gives us a chance to be heroes, and to try to save the day. So we end up running into Ravage, one of the Decepticons, who steals the Allspark just as we're about to retrieve it. Bumblebee stops him, takes the Allspark and hands it to us. Our Autobot, EVAC, takes it in and we take off. We're then chased by some of the meanest Decepticons. We face Megatron multiple times. Optimus Prime saves us a few times and eventually we're caught into Devastator's vortex, who takes us into his body through this giant vacuum, inside his guts, and we're spit out the back. We survive this because of our battle shield around EVAC, which saves us from being completely crushed. Then, Starscream [grabs us and] takes us for a ride above the buildings, above the city, and we end up crashing into a building. Then there's a final battle between Optimus Prime and Megatron. We think that Optimus is left for dead, and it's just us and Megatron. Then suddenly, Optimus comes back, he's not dead, but it's our turn to take charge and say, this time, we've had it. We end up inserting the Allspark into Megatron's stomach, as it was done in the first film. Megatron blows up, but pulls us on his way down, falling off the building. We have this giant fall down, aiming for the street. At the last second, when we think we're going to crash, Bumblebee comes to the rescue to save us. He catches us in his arms, but we crash through the street down into a lower level, though we survive. Optimus thanks us. Basically, it's the farewell from Optimus, and we get so close to him, you can really feel his breath right there, right in his face, and he's thanking us for making the world a safer place. Robert: What were a few of those little details in the ride that maybe aren't part of the main narrative, the little things on the side that you're particularly proud of? Thierry: People can ride 10 times, and you'll find something new each time. If you start looking to the side of the main character, the sweet spot on the screen, you'll see there's other characters. Where Devastator first appears, at one side you'll see Ratchet shooting at Devastator. Down below, when the train track collapses, on the left side you'll see Ironhide, one of the other Autobots, telling us where to go, pointing the way for us to escape. So there's a ton of stuff like that. It's fun because you discover new things every time you ride. In scene three, for example, which is when Bumblebee comes, Sideswipe comes in through the door and attacks Bumblebee in the back. In the back of this broken door, there's Michael Bay's airplane. A lot of Michael Bay's favorite numbers are in the ride, like E7, which is something that Michael Bay loves. In all the films he's done, he's put E7 in as numbering for warehouses for vehicles, so we have some E7s placed in the ride. For the team that worked on the attraction, we always try to place [their] names in the sets. As you travel through the city, a lot of the theaters, the hotels, some of the stores, have some team members' names on them. It's a nice little reward for the ones who worked really hard on this attraction, so they can say "Hey, I'm in that scene with the characters." I'm also glad that we were able to bring a lot of the real voice actors to this film - Peter Cullen, Frank Welker - it all contributes to making this richer and more real. It's the pattern we've been following - to go back to the source and work with the creators to bring the original cast on board to make the experience true and authentic. Robert: My favorite moment was when we go crashing into the office building, just because of the contrast of being outside, and then - boom - you're inside, flying past the desks, which are right there next to you. It makes it feel so much faster than when you're outside where objects are farther away. Thierry: (Smiles) You know who's idea that was? Steven Spielberg's. Thierry: Yes, he's been our creative consultant for all the parks. When we first had a chance to talk with him about the concept, he said wouldn't it be cool to go through a building? So, that was a perfect opportunity for us, because Michael Bay was shooting an office interior [for Transformers 3] - so we'll use the same office interior that's in the last film. That same office where Witwicky and the others were in the building that was collapsing? That's the same office we're in. Robert: So Spielberg and Bay were involved in making this attraction? That's a lot of Hollywood big hitters there. Thierry: Absolutely. And having the ability to work with ILM [Industrial Light and Magic] was a real treat - the same animators, the same cinema effects guys, the digital effects supervisor who was on the films, they all worked with us on this. We were able to be in complete synch with Michael Bay and what he was going to do with the last film. Robert: One of the things that impressed me in the ride was the way you were able to create this sense of speed. In comparing it with Spider-Man, this is like Spider-Man times 100 - just fast, fast, fast. Thierry: It's by adding little cues that make you feel like you're moving very fast. First of all, being able to be photo-realistic, so you have a better sense of the reality of how fast real objects are moving past you. On Spider-Man, being comic-book-style, there's less detail in the environments, so it's harder to get a sense of what is real and how fast you're really going. And the new generation of vehicles we have in this ride allow us to have much better cues for giving you a sense of acceleration. They're much more precise. In Spider-Man, we started to develop the media - we locked in our camera moves - three years before we opened the attraction, which got us stuck with some camera moves we didn't want to use in the end. They weren't ideal to give us the proper motion. But we're about to change that, too, because we're working on re-doing the Spider-Man attraction. What we've learned from Transformers, we're applying to Spider-Man now. It [Transformers] is the most action-packed ride experience we're ever created with the visuals, but it's easy to ride. With the technology available to us, we can create a much smoother ride experience that really supports what's going on in the visuals. It's still limited to 42 inches because of the safety restraints, but its very comfortable. You can ride it multiple times and it's a real pleasure. John: A nice thing for us, as the operators, is that Universal Creative always has the operators in early to help work on that. The way I look at it is, you can have the greatest, coolest thing in the world, but if only 10 people per hour can see it, it's never going to get built. We start out, from the beginning - we know what we want to do as far as capacity; we know how to make that happen. And then they let us come in and poke holes in it: How will this not work? How can we not get 2,000 people per hour - what are the things that would prohibit that, and then they work with us on [fixing] those parameters. To get a commitment from upper management to put a lot of money out for an attraction, it's got to get a lot of people through and sell a lot of tickets. My entire career in theme parks has been with Universal and I'm really happy that we've been allowed to do that. I've not worked for other companies, but I've heard that operations is kind of an afterthought in a lot of different places, and it has never been that way here. From queue design to graphic design, we have a voice. A good example of that? In Asia, people are more predisposed to have motion sickness. It's just something that we've noticed. So we sat down, months before everything was finished, and we went through the ride profile and Thierry's group said, will this work? It ended up that this is the profile they're using everywhere and it does work here - it's been proven in the few weeks we've been in technical rehearsal. You don't want this great thing, then everyone's getting off the ride and not feeling well. It turns out we were successful in doing that then and making it what it is now. Robert: The top question I've gotten about Transformers from my readers is: Is this coming to Orlando? And for a broader question, which gets to the recent rumors is, how do you decide what moves from one park to another park? Is there a drive to make all the Universal parks be the same, or do you want things that are unique to specific parks that never go someplace else? Thierry: First, we look at market studies to see if certain properties do well. If Transformers was not a popular property in Asia, we would not have tried it here. Then each park has a different need - a park might have a sufficient amount of high-thrill attractions, of coasters, or of live shows. So we see where there is a need, based on feedback from operations, from marketing and others, and we start looking at, okay, for this type of attraction, these are the properties that would fit well in that market and that's kind of how we decide. We don't want things to be too similar next to each other, obviously. There are multiple factors that come into play, but having the same attraction in Orlando and in LA is not going to hurt us because they are far enough away. But something as a fully immersive 3-D ride, we have Spider-Man [already] in Orlando. They don't have Spider-Man in LA, so why not put Transformers there? So far, no plans to have Transformers in Orlando. It doesn't mean that it may not happen if there's high demand for it, but.... (shakes head). Robert: Talking about meeting needs in a park, looking five years, 10 years down the road, where do you see the needs for this particular park? What kind of attractions do you need to be looking at for the long term? John: I think it's really looking at the demographics of this region, again, family is a huge thing. Asia is very family-driven. Any attraction that we can get more from the youngsters to the grandparents is going to be more of a blockbuster for us. We've seen our front gate. We have a lot of larger groups - almost 20 percent of our attendance are groups of eight people or more. And that's not a tour group. That's a family. That's grandma, grandpa, maybe an aunt and uncle, maybe mom and dad, a couple of kids. They travel together in [extended] families here a lot. So that's something we definitely need to take into consideration. We opened Battlestar Galactica, the world's tallest dueling steel roller coasters and they are popular, but there's a segment of people who look at it here in Asia and go, "No way I'm going to ride that thing." So it's taking all the pieces we have and really looking at, as Thierry said, where that next need is for us. It's not always going to be a huge, blockbuster attraction that's going to drive the business. It could be something like parades, which we're going open at New Year's Eve - our Hollywood Dreams parade is going to start here. So it's taking pieces of that to put the puzzle together, long-term. Robert: So Thierry, what are you getting excited about moving on to next? Thierry: Finishing the one in LA. I just can't wait for that one to open as well. It's going to be really fun - LA has not seen anything like it. The market there is pretty savvy. They've been to other parks, they've seen a lot, so it'll be great for them to finally see a ride like this. I've posted video of the opening ceremony for Transformers: The Ride, which followed our interview Friday night. Just click over to Theme Park Insider's Facebook page to see the video, which includes one heck of an entrance by Michael Bay. December 3, 2011 at 9:57 AM · Very cool stuff. Thierry and John definitely seem to have a great grasp of the theme park and attraction business. Other than the overwhelmingly negative feedback the JAWS move is getting, these guys have been hitting home run after home run. One thing I would still like to know, is what are their plans for a new nighttime show to replace Universal 360? Also, with the flurry of activity at the parks in the last couple of years, I am curious as to why there was so little activity from 2004 - 2008? Seemed like Mummy was added, then very little was done until the Simpsons in 2008. Just curious, for next time you meet those two gentlemen! December 3, 2011 at 9:55 AM · Awesome interview! Sounds like the only things I won't like about Transformers are three things... Devastator is a terrible character. Plus I'm kinda tired of "monster eats us, but we survive!" scenes. And finally, the whole All Spark thing is just... let's just say that nothing Michael Bay does has any real logic to it. It sounds like (other than the Mummy Ride) that Universal isn't making budget versions of their rides in other parks. That makes me very excited for the future of the parks! Hopefully they also learned from the Winnie the Pooh ride being mediocre everywhere except in Japan. December 3, 2011 at 9:21 PM · Skipped over most of the interview because of spoilers but my eyes did catch some interesting bits to the ride. This sounds just like how I imagined this ride to be like. Crazy, fast, and fun. How were they able to fit so much awesomness into one building? December 5, 2011 at 9:04 AM · Amazing detailed interview but with spoilers Robert! We can always count on Universal Creative to make the best rides out of movie franchises. Can't wait what Thierry Coup (the man's a GENIUS) and his team at Universal Creative will cook up next. By the way do you guys know that Transformers 3 is the Highest Grossing Film in Singapore? December 6, 2011 at 2:27 AM · I found it interesting that Thierry Coup said that they look at the mixture of rides in a park when they decide what to add to it. I hope that means that IOA gets a few more mid-level dark rides to complement the existing thrill rides. That would make it easier for my family to visit since only my son and I are the thrill ride junkies.